I'm so excited to announce that Glitter Guide has teamed up with Estée Lauder! We were asked to create a fun video around their BB Creme (which I love). We decided to create a quick look at a 'day in the life'. In the video, I'm running around San Francisco getting ready for a little rooftop party. Many of you know that I don't actually live in San Francisco, but we decided it was too fabulous not to highlight. Luckily, Jacin let me use her house as my own (and her cute puppy)! This was such a blast to work on and we hope you enjoy it! this is so exciting!you look so lovely! love that trench on you! wow, how fun ... you are one lucky girl!! 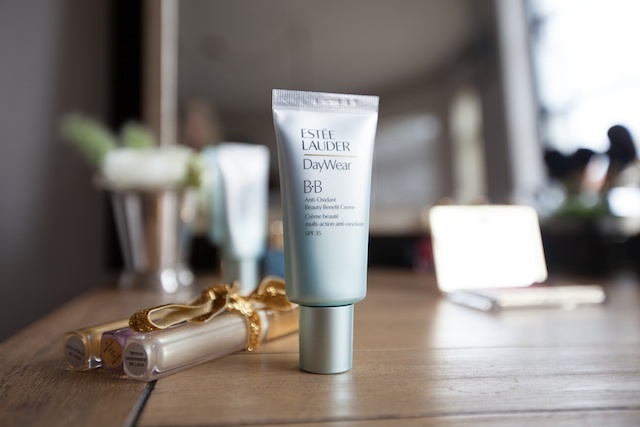 I absolutely love the Estee Lauder BB Cream. I've been using it non-stop since I bought it a month or so ago. I reviewed it on my blog as well! Looks like you had so much fun, Love your dress at the end! Love this! You are beautiful and the ad is so fun :-D I'm off to buy the product now too. You look so feminine and gorgeous!! your so lucky to get to do these types of projects! You look so beautiful in the pictures, and you set a high standard for us newbie bloggers out there. Where could I find that shirt?! Beyond adorable - loving your trench coat...where is it from? You look so pretty! Love your hair girl! That was such a great video! You looked stunning in that yellow dress. How exciting! It looks like this shoot was so much fun and you look gorgeous! that was great!! loved the video!! You look beautiful and I'm dying to try that cream!!! I only buy Estée Lauder products! Aww, what a fun video! You are so beautiful, Taylor! You look gorgeous (as always)! Looks like it was a great shoot... & a great opportunity for you. You are so classic! Congrats! So cute! I found your blog through The Everygirl and love it! Even though you don't live in the city, do you have some favorite SF spots? I am heading there at the beginning of May for a couple days before I go to Sonoma. Gorgeous! Love the look. And congratulations- this is super duper exciting for you! Oh, Taylor, you look stunning! I couldn't think of a better person to team up with a makeup company! How exciting! Congratulations! I have been following Glitter Guide for a long time now, but I never even realised that you had your own personal blog! I love it, and will be following for sure from now on. Hope you can take a look at mine some time - would mean so much! totally amazing - you look stunning as always! Great photos- cute video. Congrats! You have a beautiful blog! Congratulations on your Estee Lauder campaign. You look fantastic. Looking forward to following and reading your blog. Have a Happy Saturday! THis video is so great! Congrats on this amazing collaboration! You are gorgeous taylor and have one amazing smile! The video is fabulous and i love the outfits! Really well done vignettes!! You have great style! I wonder where your gold iPad sleeve is from? Thanks for making us travel with you through your beautiful photos!